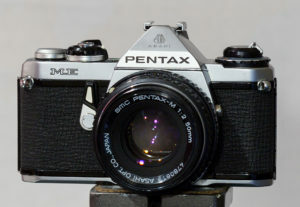 1977 marked the introduction of the M series chassis for Pentax, and in many ways represented “catch up” to Olympus, who had introduced the compact OM-1 in 1972. The ME was squarely aimed at the amateur market, as it offered aperture priority automatic exposure only – just like the Nikon EM launched the same year. Coincidence? Polycarbonate materials are used much more widely than in any prior Pentax body, and the weight loss of 220g (roughly 30%) from the K2 shows the benefit. As with the K2 the ME uses a vertical, metal bladed shutter with speeds from 8s to 1/1000th and flash sync at 1/125th. Vertical shutters have less distance to cover than horizontal, and thus sync speeds are now commonly 1/125th instead of the 1/60th seen earlier. The body has an aluminum alloy skeleton with quite a lot of structural plastic components. Exposure metering and shutter speed are both controlled by microprocessor, which presumably Pentax had already been working on when Canon launched the AE-1 just a year earlier. The M chassis marks the first time that the option of a power winder was offered, other than the specialized K2 MD briefly available, Pentax having never seriously sought the sports professional market which was largely owned by Canon and Nikon. The automatically chosen shutter speed is indicated in the viewfinder by the presence of an LED dot alongside printed speed markings. 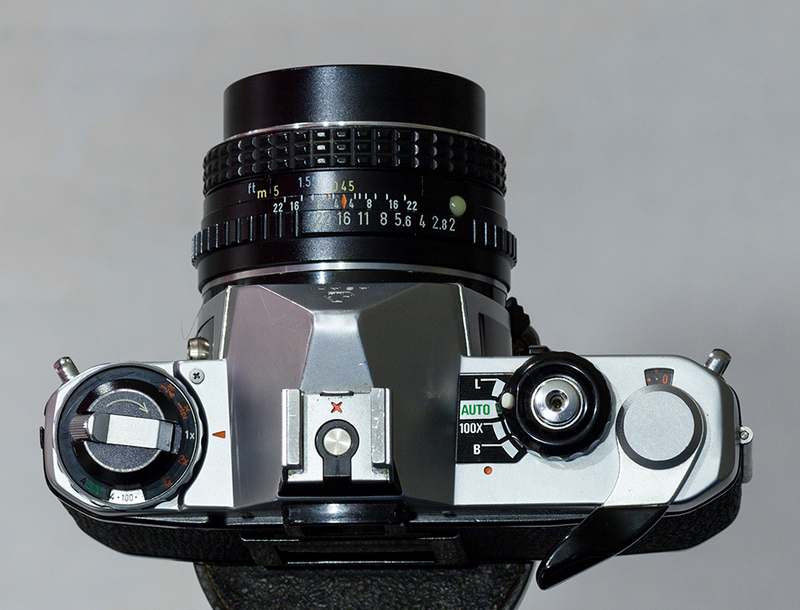 Also in the viewfinder is a split screen at the center of the focus ring – just like the AE-1 of 1976 – surrounded by a micro-prism collar. Screens were fixed, and the view provided big and bright. The ME and MX set the stage for (arguably) ever Pentax SLR since, with an emphasis on compact design and excellent ergonomics. 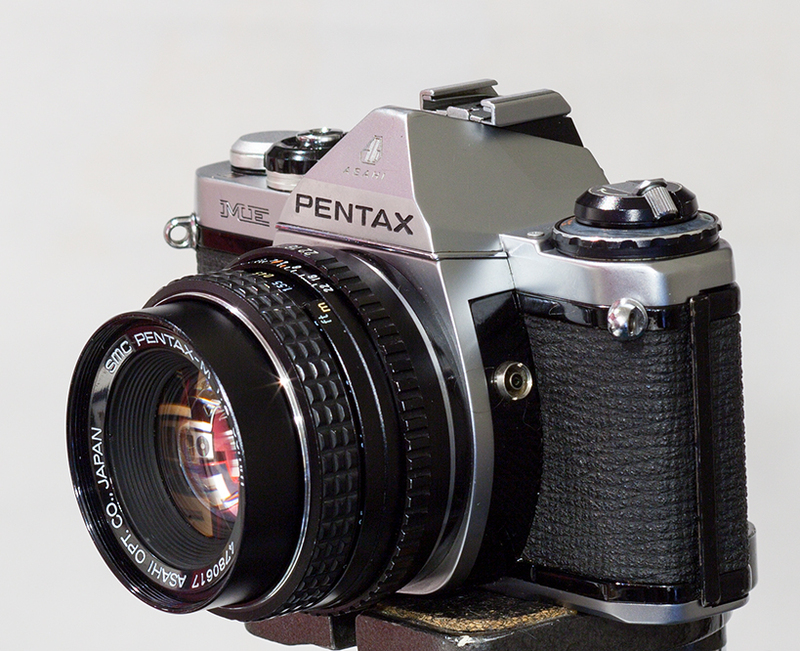 They were the first Pentax’s to offer powered advance, the first to use plastic extensively in the body, and marked the introduction of the M series of compact lenses – continuing to leverage the K mount. Purchased during December 2012 for $45 on eBay, this example is pretty solid. The leatherette body covering is slightly more worn than most, making it a good candidate for re-covering. 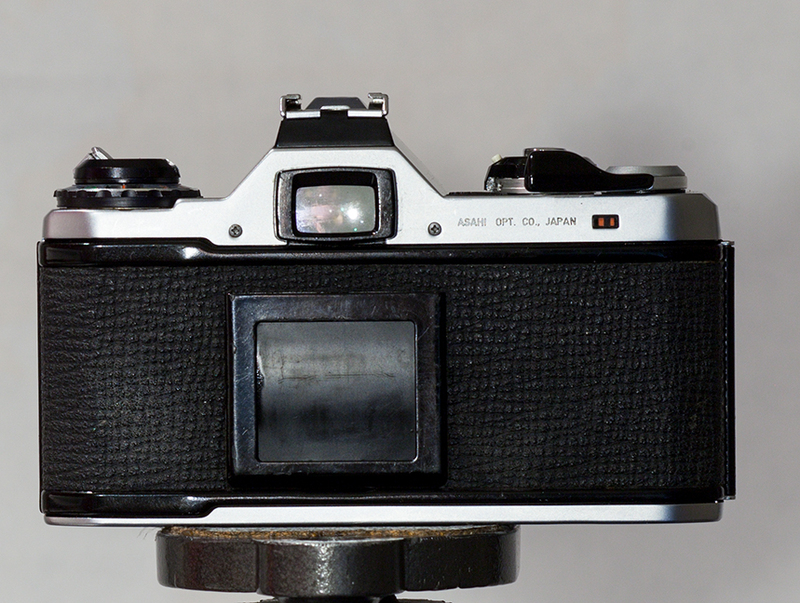 The viewfinder is quite dirty (still), but winding and firing are both smooth and quiet.